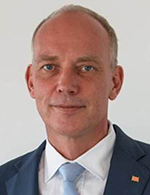 Mr. Carsten Sommerhage is CEO of Columbia Shipmanagement group of companies and Managing Director of Columbia Shipmanagement (Deutschland) GmbH since its establishment in 1995. Further to the ship management Carsten Sommerhage has been responsible for the operation of hotels and other side businesses in Germany. Carsten Sommerhage has 11 years of seagoing experience . Amongst other boards, he is Chairman of the Board of Directors of the German Shipowners Defense Association.